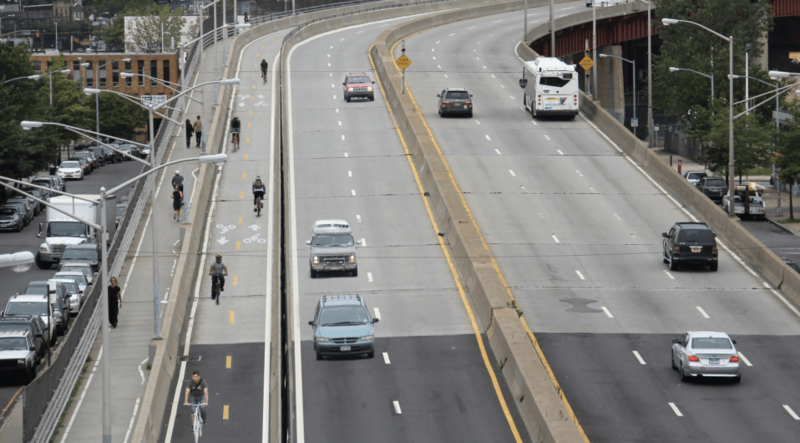 DOT has started work on the much-anticipated Pulaski Bridge bikeway, which will more than double the space for people walking and biking on the bridge. The Pulaski Bridge spans Newtown Creek, linking Greenpoint and Long Island City. Right now people who cross the bridge on foot and by bike are crammed into one eight-foot lane next to six lanes for motor vehicle traffic. DOT will convert one southbound auto lane to a two-way bike lane, to be separated from pedestrian and car traffic by concrete barriers. I am happy to announce that construction has begun on the Pulaski Bridge dedicated bike lane. I have been advocating for this bike lane for nearly five years and I am thrilled that the project is underway. I am hopeful the project will be completed by the end of the summer, finally allowing pedestrians and cyclists to safely travel over the bridge. Lentol posted a DOT construction announcement on his Facebook page. DOT began planning the bikeway under former commissioner Janette Sadik-Khan. The original construction timetable called for it to be completed in 2014, but red tape pushed it back a year. The redesign is also expected to help calm traffic on deadly McGuinness Boulevard by slowing drivers as they enter Brooklyn from the bridge. Better late than never I guess. Can we connect this with Kent and Vernon with actual bike infrastructure sometime this decade? Anyone know how long this is supposed to take? It seems like such a minor project, but of course in the corrupt world of NYC government construction it’ll be no surprise when putting up some Jersey barriers and restriping takes six months and cost $5 mil. I’m confused as to what this project actually entails from an engineering perspective. I know the drawbridge complicates it, but it seems like they basically just have to slap down some Jersey barriers and new paint. There’s no reason to think that how long this is “supposed” to take will have any baring on how long it will “actually” take. NB that the start date is already past the planned completion date. Further, if I recall correctly, the reconfiguration of the bike/ped infrastructure is part of a larger DOT project. It will be done when it’s done. For something more specific, consult some tea leaves or The Oracle. Should I avoid riding this way in the mean time? Is the bike/ped area being reduced during construction? Has anyone actually seen construction take place? Still looks exactly the same.